Majors Draws Down Victory in San Diego! Michael Majors' reluctant deck choice proved to be the right one, as Blue-Red Tutelage takes down San Diego! The big story coming off Pro Tour Magic Origins was "Just what does the Standard metagame look like?" One person, Michael Majors, answered in way no one expected—mill. Taking a page from Andrew Cuneo's book, Majors played Blue-Red Tutelage solely because he couldn't get the cards together for any other deck, and utterly destroyed everything in his path. He won the finals in short order and hoisted the Grand Prix San Diego trophy above his head. So that's an answer to the metagame question, but it surely isn't the only one. The Magic Origins Standard format is less than a month old, and just about every deck seems viable. Multiple Constellation decks, many aggressive decks, and even a Jeskai Tokens Control deck made it deep into the second day. Any of these could be the next top finisher if the metagame shifts accordingly. Though nothing is certain, and Standard will continue to evolve, it might be time to add those Cranial Archives to your sideboard. From everyone here in San Diego: Thanks for joining us for another great Grand Prix weekend! Goodnight! Almost 1,500 came in and 167 remain. Welcome to Grand Prix San Diego Day 2. Since Pro Tour Magic Origins there’s been lots of speculation on how the metagame is now defined, or even if it’s even defined at all. Though Blue-Red Ensoul Artifact and Red Aggro were the big winners last weekend, people weren’t so sure if that meant anything about this weekend. At the end of first day, there are some answers, but more questions. Dromoka’s Command decks are definitely good against the former top two—but are they good against the field? Just what is the new face or Standard? We’ll find out today. Four players finished the first day at 9-0. (15) Shahar Shenhar, Mike Majors, Benjamin Weitz, and Corey Burkhart all got in with the big ol’ goose egg in the loss column—playing four different archetypes too. They’ll look to keep those streaks alive long into today. 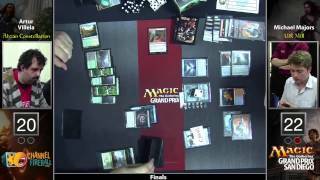 Streaming at twitch.tv/channelfireball is up now! Join us for the action! Sphinx’s Tutelage: A Majors Deck? If Pro Tour Magic Origins was the Rise of Magic Origins Standard, then today was the Dawn of Magic Origins Standard (if we’re going by Planet of the Apes prequel rules). The format has changed greatly since the last-ever core set, and this first day in San Diego has borne out as such. Though there’s still some of the old guard doing well—Green-red Devotion, Abzan Control, etc.—but there’s a lot of new hotness. There are thopters, more red men, lots of constellations, and even a few Alhammarret’s Archives. Perfectly navigating this field of nearly 1,500 were four intrepid souls. (15) Shahar Shenhar, Mike Majors, Benjamin Weitz, and Corey Burkhart all finished this first day 9-0. They are the players to beat tomorrow. What will the new face of Standard look like? We’ll have a much better idea after six more rounds tomorrow. 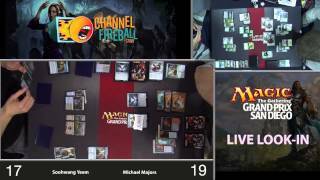 Join us bright and early over at twitch.tv/channelfireball to catch all the action. 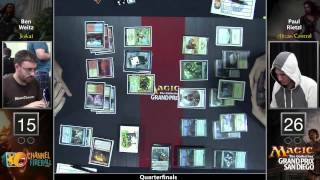 The hashtag for Grand Prix San Diego is #gpsd. Join the conversation!